Sublime Lock HD is a nicely designed lock screen mod. 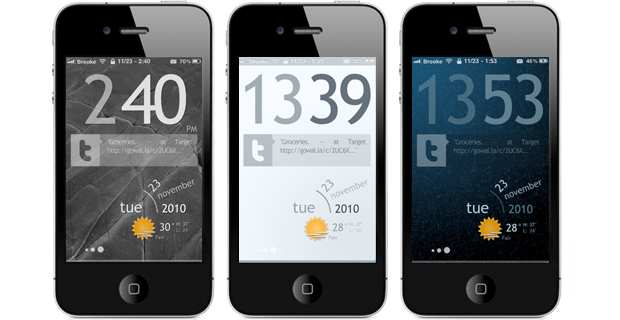 The mod displays the current time, date, temperature, weather conditions, twitter feed and has a decent amount of themes to choose from. What I love about this lock screen is that it is SUPER easy to customize… like seriously anyone can do it… there is no coding involved. Below are step-by-step instructions on how to install, activate and customize this lock screen. Side Note: The instructions might look long but that is only because I explain every little step. LockInfo, by David Ashman, is a seriously sweet mod that allows you to add information to your lockscreen such as; weather information, upcoming calendar events, missed calls, missed text messages and new emails. Once installed, you can find LockInfo in your stock Settings application. The application is extrememly customizable and has some pretty cool features. 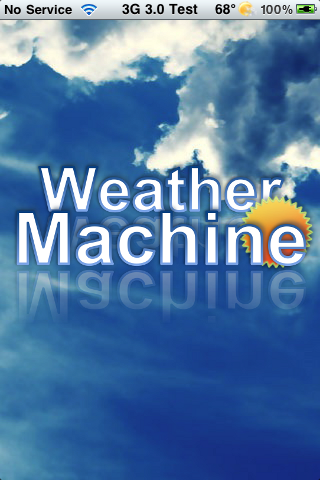 There was another update to the WeatherIcon mod. The updated says that it adds “more 3.0 compatibility.” When I tested it, I was able to enable the Status Bar Image and Temp but, they are not aligned correctly. They are too high on the Status Bar and are only partially visible. The WeatherIcon mod (a mod that allows the current temperature and weather conditions to be displayed on your weather icon) has been updated to version 2.1.2 which allows it to work on the 3.0 firmware. The status bar part of the mod still is not working on 3.0 but, at least the icon part of the mod is! 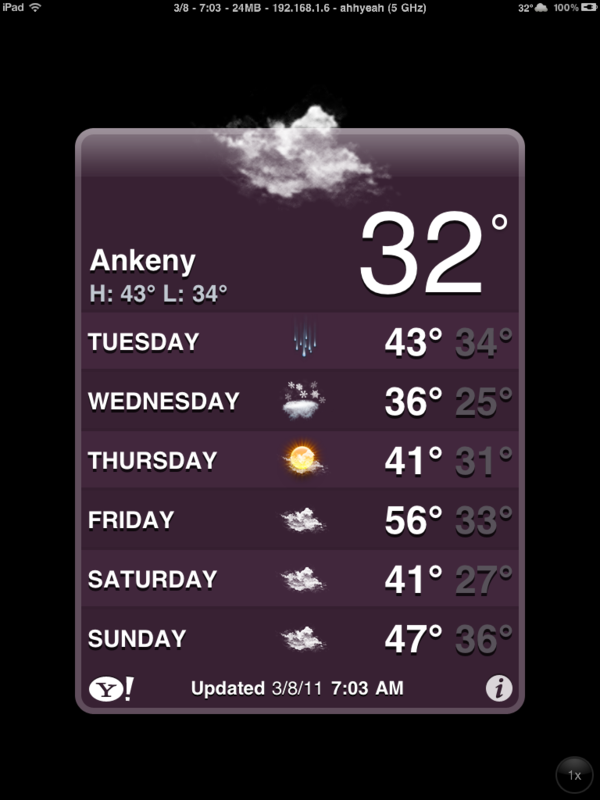 When I first installed WeatherIcon, on my iPhone running 3.0, it went into safe mode. I restarted the SpringBoard again, as prompted by the safe mode pop-up, and it worked fine. The same thing happened when I updated the mod on an iPhone running 2.2 firmware as well (safe mode, restarted, worked fine). I’ve had a bunch of people ask me lately how I got this full screen weather map on my iPhone so I thought I’d share it with you all. First, it’s a web app. Don’t be scared, it’s still really nice. 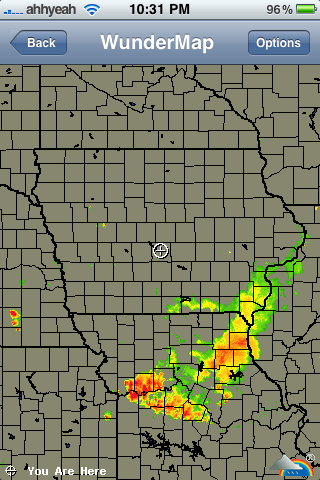 Go to http://i.wund.com from your iPhone and pic the city you want the radar to start on. You can either search for it or Safari should ask if the app can use your current location. Once you do that, scroll down to the radar option and click on “View Full Screen WunderMap” located just under the radar image. Once this screen is open, tap the plus sign at the botton of the webpage. Tap “Add to Home Screen” and rename it to “Radar” or something short. OK, I have held off on writing about this app for a few days because it was getting updated so frequently and I wanted to let a few updates pass before talking about it again. I will say, the updates have made using this application much easier than in the first few version of the app…you can check out that article HERE. So, lets talk about what the app looks like now.